We have been remiss in welcoming Hull City to the shop! 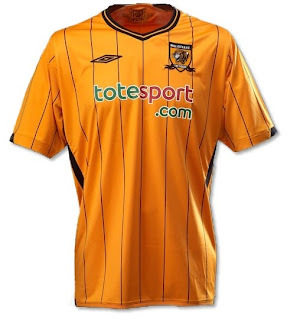 The Cinderella story of the 08/09 season: Hull City's first ever Premier League (and top flight) season ended successfully as the Tigers avoided relegation by a mere point - is now one to relish with the Hull City 09/10 Home Soccer Jersey! With the recent addition of American star Jozy Altidore, the Tigers look even better for this season.